There are many infant formulas on supermarket shelves and it may leave new mothers confused about the best product for premature babies. Choosing a formula is definitely a decision that should be made with your neonatologist or pediatrician. However, learning about the different types available can help you have an informed discussion with the doctor. Most formulas for infants are made from cow's milk and designed for full-term babies. Although science has not been able to craft an infant food with all of the nutritional and immunological benefits of breast milk, infant formula is a safe alternative. Modern formula is enriched with iron and fatty acids to promote brain development, along with all of the nutrients that growing babies need. Examples of regular baby formulas include Similac Advance, Enfamil LIPIL, and Nestle Good Start. Premature babies and low birth weight babies often need special formulas to catch up on their growth. According to the American Academy of Pediatrics (AAP), your doctor will want to ensure the baby is getting a sufficient amount of calories and that all of his nutritional needs are met. In the beginning, this may mean intravenous feedings and, as he grows stronger, move on to supplemented formulas in the NICU and after they get home. If you intend to breastfeed but your baby cannot do it directly right away, it is good to keep expressing it. Your doctor may recommend that he be fed your breast milk because, according to the AAP, it offers the best nutrients for fragile babies. It's also possible that a supplement, such as a human milk fortifier (HMF), will be recommended for your own breast milk. You can also freeze your breast milk and store it for later and continuous pumping will ensure your milk supply does not get interrupted. When preemies first start taking milk feedings, doctors start with small amounts of formula at a calorie ratio that mimics breast milk. 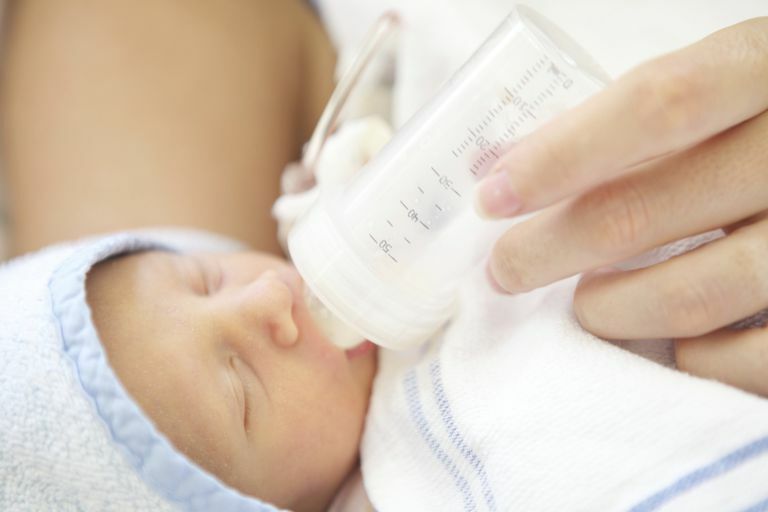 As babies get more used to feedings, doctors may start using higher-calorie milk to help babies grow more quickly. In the NICU, doctors use products designed for newborn preemies, such as Similac Special Care and Enfamil Premature LIPIL. These formulas have more protein than others and can be mixed together to offer higher-calorie preparations. Before premature or low-birth-weight babies are discharged from the hospital, they are typically changed to a preemie discharge formula. These include products like Similac Neosure, Enfamil Enfacare, and Cow & Gate Nutriprem 2. They have higher calories and more protein, vitamins, and minerals than regular infant formulas, so that catch-up growth started in the hospital can continue past discharge. Premature infants who are breastfed or receiving expressed breast milk may require more calories than breast milk provides. In cases where doctors feel like fortifying breast milk is the best choice to enhance growth, a human milk fortifier (HMF) is used. HMFs are powders or liquids that are added to breast milk to increase the amount of protein and calories in the milk. They are used with premature and small babies to help them gain weight faster and catch up to their peers. Most often, the formulas use cow’s milk, though soy, hypoallergenic, and lactose-free formulas can also be used to fortify breast milk. Some companies also offer fortifiers that are produced from donor breast milk. If you are pumping milk for your premature baby, your doctor may prescribe HMF to be added to your baby's breast milk. Although moms of premature babies have breast milk that is often higher in calories than moms of full-term babies, it's still important to add extra protein to your milk. Developments are still being made in these fortifiers. For instance, one study compared the effects of a newer powdered HMF that had 16 percent more protein and more micronutrients than another HMF. The result was that the protein- and fat-fortified breast milk improved weight gain in premature babies. Premature babies with digestive issues may benefit from changing their usual formula to a different blend. Formulas for sensitive stomachs are designed for full-term babies and may not have enough calories for preemies. For this reason, it's important that you do not change to one of these products without talking to your pediatrician first. The protein in cow's milk can be difficult for some babies to digest. Babies with milk allergies may have diarrhea (sometimes with blood) or skin or respiratory problems. Soy proteins don't contain cow's milk, they are soy-based instead, and may help to alleviate symptoms of feeding intolerance. These formulas include Similac Isomil, Enfamil ProSobee, and Nestle Good Start Soy. Some babies are allergic to both cow's milk proteins and soy proteins. Hypoallergenic formulas contain pre-digested proteins, so babies who are allergic to milk proteins are usually able to tolerate hypoallergenic blends. These products are also lactose-free and include Similac Alimentum and Enfamil Nutramigen. On occasion, a baby may not have enough lactase, the enzyme used to digest the milk sugar lactose. Because these babies don't digest milk sugars well, they may be fussy or cry excessively. Lactose-free formulas like Similac Sensitive or Enfamil A+ Lactose-Free may help these babies cry less and feel more comfortable. Babies with severe stomach problems may not be able to break down even the predigested proteins found in hypoallergenic formulas. For these infants, a formula that contains free amino acids (the building blocks of proteins) may be the only option. Amino acid formulas are suitable for children who have severe or life-threatening food allergies, who have had surgery on their intestines, or who have other severe gastrointestinal problems. These products, such as EleCare, Enfamil Nutramigen AA, and Neocate, are lactose-free and may contain special fats for children who have difficulty absorbing fats from regular formulas. Premature babies can make parents worry, especially when it comes to feeding because it's vital to their growth. It's important that you talk to your doctor about any concerns you have, she will be able to guide you to the best formulas and fortifiers that your baby needs. American Academy of Pediatrics. Caring for a Premature Baby: What Parents Need to Know. HealthyChildren.org. 2015. American Academy of Pediatrics. Providing Breastmilk for Premature and Ill Newborns. HealthyChildren.org. 2015. Rigo J, et al. Growth and Nutritional Biomarkers of Preterm Infants Fed New Powdered Human Milk Fortifier: A Randomized Trial. Journal of Pediatric Gastroenterology and Nutrition. 2017;65(5):e83–e93. doi: http://dx.doi.org/10.1097/MPG.0000000000001686. Will Your Preemie Learn Walk at the Same Time as Other Babies?